Sunshine and the beach first come to mind about the island of Hainan – China’s southernmost province, an allure that is increasingly known worldwide as it is set to become an international tourist destination. As of Jan. 10, 2013, sales of duty-free goods in Hainan totaled about 5.2 million items with the total sales of 3.4 billion yuan. About 1.6 million people are there for duty-free goods shopping. In 2012, tax rebate shopping policy made the province closer toward its goal to become an International Tourism Island. The policy effectively helped the transformation and upgrading of the tourism industry on the island, as well as further optimized the structure of Hainan tourism consumption, boosting the province’s service revenue significantly. 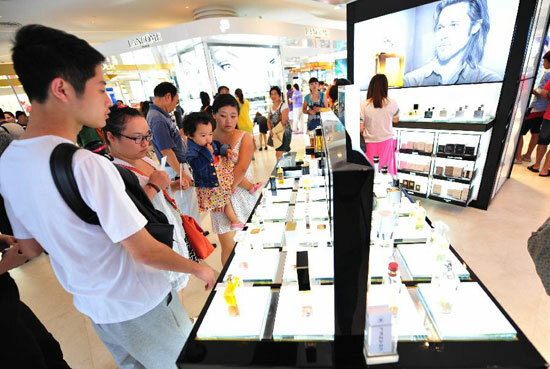 Last year, Hainan sold about 3.5 million duty-free products, with the daily average of 9,617 items, an increase of 129 percent. Sales total amount reached 2.4 billion yuan, with a daily average of about 6.5 million yuan, a year-on-year increase of 143 percent. The total number of customers totals about 1.1 million, with per capita consumption of 2,230 yuan, a year-on-year growth of 12 percent.